After a dozen-year hiatus, Paramount reboots the Jack Ryan franchise with yet another new recruit, tapping Chris Pine for the role first played by Alec Baldwin, most associated with Harrison Ford, and best forgotten by Ben Affleck. 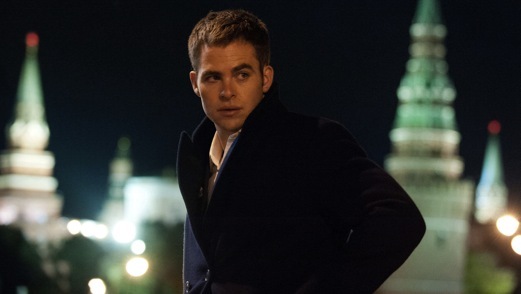 This time, the story starts at the beginning of the reluctant spy’s career, swiftly summarizing his education at the London School of Economics circa 9/11, his tour in Afghanistan with the Marines, and the helicopter crash that leaves him with a debilitating back injury—all before the title Jack Ryan: Shadow Recruit appears on the screen. Jack’s backstory echoes the original mythology set forth by Tom Clancy in his 13 novels, though the character is transplanted from the Cold War to the post-9/11 era. By the time the action starts, Jack’s been recruited into the CIA by his handler Thomas Harper (Kevin Costner, gracefully segueing into a mentor role). Jack takes a job at a bank on Wall Street as a compliance officer, but secretly he’s keeping an eye out for terrorist plots against America’s financial system. When he notices some unusual transactions by a Russian client called the Cherevin Group, he travels to Moscow to audit the bank—and is thrust into the field. It’s no wonder Pine, who also assumed the iconic mantle of Star Trek’s Captain Kirk for Paramount, has emerged as a studio darling. He’s awfully charming but also brings pathos to the role of a desk jockey suddenly fighting for his life. The horror of his first kill—perhaps along with lingering back pain—isn’t spelled out in the script. It’s written on his face. Meanwhile, helmer Kenneth Branagh (Thor) provides a masterclass in playing the villain, Viktor Cherevin, an old-school Russian oligarch intent on taking down the United States, which has moved on to borderless enemies. His scenes are dripping with poetry and thick with suspense—although it’s unclear when he kidnaps Jack’s girlfriend, Cathy (Keira Knightley), and threatens her with gulag torture techniques in the midst of a car chase how he’s going to get what he wants if he keeps running away from the person who has it. Knightley’s the weak leak, though probably through no fault of her own. Once again, although the marketing campaign suggests a larger, and perhaps traitorous role, the female lead is arm candy to the hero. The script tries to insert her directly into the action, and she acquits herself well when given the chance, but ultimately it’s a contrivance to give Jack a personal stake in the plot. It doesn’t help that the couple doesn’t demonstrate much chemistry. Refreshingly, Jack Ryan: Shadow Recruit doesn’t participate in the action-set-piece oneupmanship that’s currently plaguing the genre (hello, A Good Day to Die Hard!). Jack doesn’t destroy the city; he saves it. Still, there’s a kinetic energy even in the film’s investigative scenes—where brains and computers are doing the heavy lifting—due to Branagh and cinematographer Haris Zambarloukos’ dynamic, often handheld, in-your-face camerawork. There’s a lot that’s retro about Jack Ryan: the character, the enemy, the grainy ’70s-esque visual style. And restarting storied franchises risks fan fatigue (The Amazing Spider-Man? Too soon!). But there’s enough fresh blood here to warrant giving the property another shot.